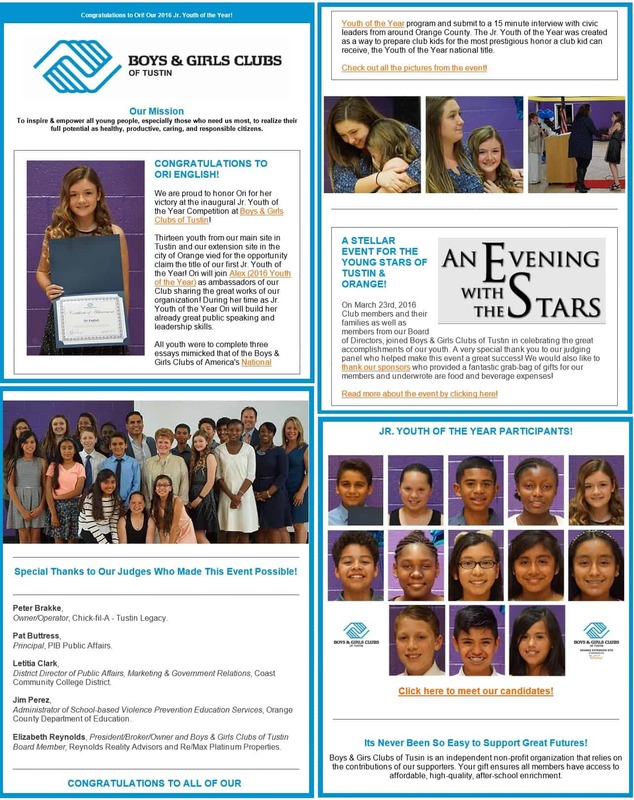 On March 23rd, 2016 Club members and their families as well as members from our Board of Directors, joined Boys & Girls Clubs of Tustin in celebrating the great accomplishments of our youth. A very special thank you to our judging panel who helped make this event a great success! We would also like to thank our sponsors who provided a fantastic grab-bag of gifts for our members and underwrote are food and beverage expenses! Special Thanks to Our Judges Who Made This Event Possible! Elizabeth Reynolds, President/Broker/Owner and Boys & Girls Clubs of Tustin Board Member, Reynolds Reality Advisors and Re/Max Platinum Properties.